This is my best friend Pumpkin. He was born in Delhi, NY and was adopted by me and my Fiancee` in October 2000. Pumpkin was hanging around our car when we pulled into the driveway of my sisters house upstate and was looking for attention as soon as we got there. He was a barn cat and looked like he wanted a warm cozy home to live in. My sister happens to love animals and brought him into the house. He was in Heaven. He made himself at home and fit right in with the other animals in the house. He wanted no part of the outside world and all he wanted was love. He jumped into my fiancées lap and we knew he was coming home with us. 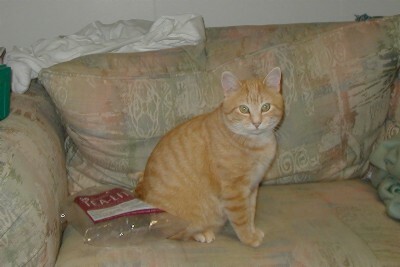 Now, Pumpkin lives with us on Long Island and is part of our family. After a few routine visits to the vet, Pumpkin is better than ever. 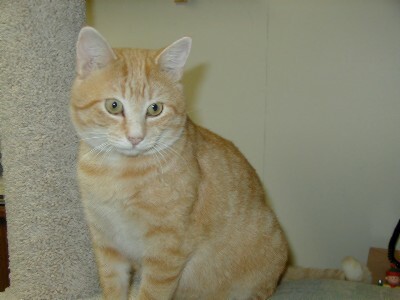 He is a little over a year and is considered a classic tabby. He loves his new home and has no urge to go outside at all. He loves all the attention we give him and hates to be alone. He loves to lay in our laps when we are watching TV, and he loves to have playtime as well. I am so happy we were able to give Pumpkin a home.